Mulch Mulch Mulch! Sounds like bugs eating your garden. It’s actually a way of preserving your efforts in the garden. Gardening newspaper articles, magazines etc. are all on the bandwagon. Garden centres sell hundreds of bags of various types. What’s it really all about. 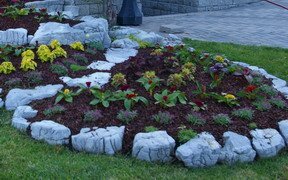 Like many things that are good for us, mulch has moved to the trendy side of gardening because it also looks good. 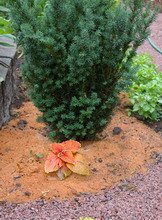 The basic premise of any mulch is that it covers the bare soil. This keeps the sun’s rays from evaporating the soil’s moisture and it reduces weed growth because the weed seedlings do not get enough light to flourish. Please note that I said “It Reduces!”, you will still get some weeds but hopefully very few. Most mulches are organic in nature and they also add their organic matter to the soil as they decompose. Thereby slowly improving the quality of your soil. They apparently also make flower and shrub beds more visually appealing then the bare soil does. Old newspapers, either flat or shredded make an excellent mulch but you don’t see much of that being used in people’s front gardens. Well, unless you are the very rare gardener who appreciates the benefits of recycling and want’s to demonstrate that, to your neighbours, then the old newspapers are probably ruled out. Grass clippings can work but they are best left to fall between the grass blades to decompose there and help the lawn. That leaves most of us with the commercially available products. Shredded and, sometimes partially decomposed, conifer bark is the most widely available. I have seen Pine, Cedar and Hemlock. Pine (top picture is natural pine being applied,) is the most common and to prove my point about its appearance mattering more than it’s horticultural benefits, it now comes died in a variety of colours. You certainly do notice a front yard filled with brick red mulch and if colour gets some gardeners to conserve moisture I guess it’s like using Fruit Loops to get kids to eat their cereal. One of my personal favourites is Coca Bean shells. They are a rich dark brown and you can sit on the deck and be surrounded by the heady smell of Chocolate. Not that I’m a chocoholic or anything. They are rather more expensive than the bark chip mulches and that’s why I restrict their use to the bed beside the deck. If you happen to live near a sawmill or are an avid woodworker as well as a gardener then the readily available sawdust is also a fine dense mulch that varies in colour depending on what went through the saw recently. I’ve been working on a lot of Cedar trellising and now have two small beds with a light vibrant “Cedar” coloured coating. Compost is really not a mulch as it is already too decomposed to act as a shield from the sun. Weeds would only enjoy its presence. 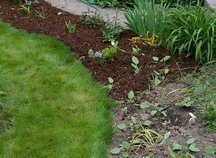 Adding a layer of good compost to your soil and working it in lightly, before you mulch, is still a wonderful thing to do. A comparison study of various mulches is available here.